I don’t know if this was related to the recent blackouts, but the Internet has been really crappy over the last few days. Since yesterday it’s finally back to normal – normal Indian Internet speed, that is. Time for new pictures and blog posts. You’ve heard of Taj Mahal, probably. For those who don’t know the back story: Taj Mahal was built by an emperor named Shan Jahan, as a mausoleum for his third wife Mumtaz Mahal (Taj is just a short name for Mumtaz). 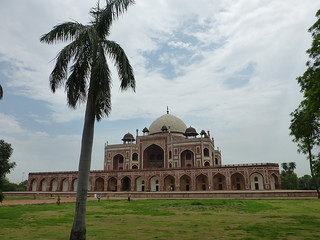 There exist, however, several other places like Taj, and on of the first and most influential to Taj’s architects is located in Delhi: Humayun’s Tomb. While it cannot keep up with the majestic beauty, the sheer amount of marble, and the intricate carvings of its more famous pendant, it is worth a visit for sure. 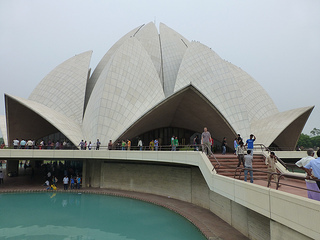 Its remote location in the South of Delhi and the fact that there are more famous places around Delhi has a nice effect for visitors: it is much less crowded than similar places. You can enjoy the gardens on your own and take as many pictures as you want without having to fight for your spot. Yesterday night, some of us (the interns staying in the guest house) woke up at 5am. All of the sudden, it had become humid and hot in our rooms. What happened? The A/C was turned off, and so was the fan; the wet shirts from my laundry contributed to the insane humidity in our room. “Oh, another power cut”. This may need some explanation: India is almost constantly consuming more electrical power than it’s producing. There are unscheduled power cuts where you are left without power all of the sudden, but sometimes even scheduled power outages; when I arrived in Delhi this was the case, where at about 11 am the whole district was without power for about an hour. All buildings are prepared for that by having backup generators. But this time it was different, because usually a power cut never lasts longer than 1.5 hours in the more developed districts of Delhi, and generators can compensate up to 2-3 hours powerlessness. Since I felt that I won’t get a good amount of sleep in this heat anyways, I went to the bathroom and took a shower. Just in time: as I heard later, I was one of the last people to get a shower. Due to the long-term outage of power, generators didn’t have any fuel left, and the basic services (such as water pumps) were not working anymore. At about 7am not only power was gone completely, but even water was not flowing anymore. Complete Northern India was affected – 7 states, more than 300 million people, at least 10 hours without power. As a result, IBM was completely crowded – I’ve never seen so many people working in the morning. For one thing, some of them didn’t have power at home; but as I learned later, they also knew that with every hour the traffic might get worse and you want to get home as soon as possible. When I arrived, I was quite lucky – there were some light rain showers, bringing down the temperatures by 5 degrees. On the days before my arrival, Delhi experienced a heatwave of up to 49° C, and the unusual pre-monsoon shower helped to take away most of this heatwave. One doesn’t want to imagine where temperatures would have gone otherwise, because monsoon was a bit delayed this year (started around July 5th). After that, the remainder of June was pleasantly warm, between 40° C and 44° C peaks during the day. I say pleasantly because I mean it. I had no problems with these temperatures whatsoever, especially since it was dry heat. Drink enough and you’re save. I wasn’t even sweating much. First of all, let’s answer the same question that I had when I first heard that this city is called “Pink City”. The answer is simple: when the Prince of Wales visited Jaipur in 1876, the whole the city was painted in pink. 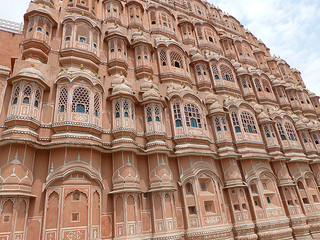 Like you can see in this picture that shows one of Jaipur’s main attractions: Hawa Mahal, or “Palace of Winds”. What you see is the famous outside view with almost a thousand of small windows, where the many women of Jaipur’s kings would be able to watch the street parades without being seen from the outside. What you can’t see is the immense building behind it, with many different stories, balconies, and courtyards. There was even a small tower which allowed for an amazing bird’s eye view of Jaipur. Hawa Mahal is just one of many architectural sights in Jaipur. In fact, the whole place is one jaw-dropping experience, consisting of several pieces of art put together in one big city. I have no particular sense of “art”, but driving through Jaipur was just amazing and without a doubt it ranks very high in terms of “visually stunning cities” I’ve seen. 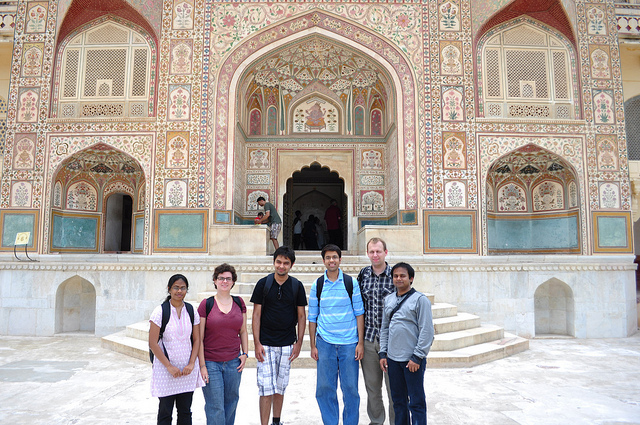 Located a bit outside of Jaipur is Amer Fort, the most scenic place around this area. 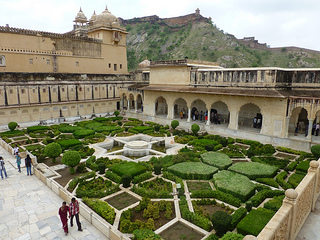 It has similar architectural style as Red Fort in Delhi, but it is bigger and better in every dimension: located on top of a mountain, wide-ranging multi-layered structures, beautiful gardens, and temple-like buildings with decorations all over. If this isn’t even for you, it offers breathtaking views over Amer, the over 3000 year old settlement which eventually expanded south to what is today known as Jaipur. But not only the architecture in Jaipur is amazing. Traffic sometimes might slow down because there’s not only cars and other vehicles on the road. 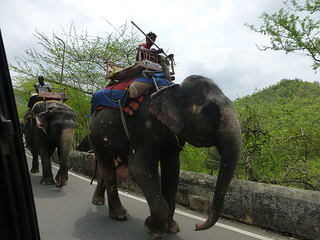 While elephants are not allowed inside the city and are, according to what we’ve heard, mostly used for transport to Amer Fort, camels are all over the place (and man, are they huge!). Jaipur offered everything one expects from the stereotypes of this semi-desert region: camel ride, elephant ride, snake charming, and of course (as everywhere in India) amazing food. This thali was called “Maharaja dinner” and stood up to it’s name – it was really delicious, though we couldn’t identify many of the things on the plates. Jaipur was an amazing trip with so many interesting things, it’s too much for one blog post. Things we visited are besides the aforementioned Amer Fort and Hawa Mahal the King’s Palace, Janta Mantar, Jal Mahal (the water palace, we didn’t go there but took pictures of it), and Chokhi Dhani. I urge you to take a look at the Flickr set – it’s worth it! Thanks everyone for the great trip! One of the most stunning places we’ve visited in Delhi so far is Red Fort. 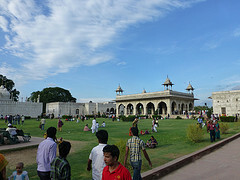 Red Fort was built in the 17th century to serve as residence for the Mughal emperor and not as one might usually suggest for the purpose of defense. Its location baffled me when we went there because it’s located in the middle of Old Delhi, which was at the time a flourishing part of the city and not on the outskirts where intruders would want to start an attack. It comprises of many different buildings, as its a really large place. We completely underestimated this, going there on a later Sunday afternoon and got to see only the main parts. 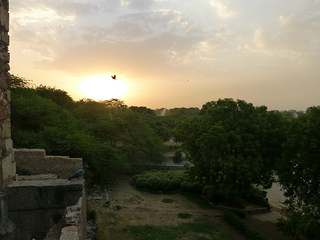 However, it was one of the most beautiful days in Delhi so far, so we took advantage of it and stayed until sundown. 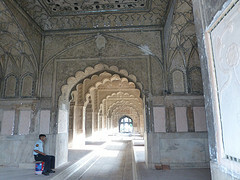 The pavilion you can see on the right hand side is called Diwan-i-Khas or “hall of private audience”. It was covered with thousands and thousands of small carvings and little marble stones put together to form pictures, as can be seen in the picture on the left. For some reason, its roof seems to create strange flows of air, which is why we saw some hawks literally standing in the air with their wings spread out – look at this picture. Just like these hawks, we enjoyed the place very much, although we didn’t share their view. 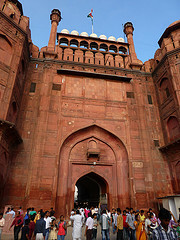 See more pictures from Red Fort (and other places in Delhi) in my Delhi album on Flickr. It’s halftime! Just about time to start a series of posts about the beautiful places I visited in India. 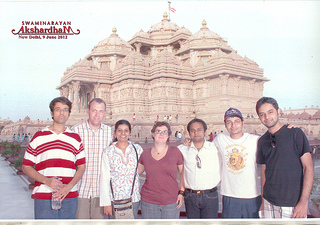 I’ll start with something that I already did on my second weekend after arriving here: Akshardham. Unfortunately, you aren’t allowed to take any pictures there – the whole area is secured like an airport and you have to leave all electronics (even USB drives, for whatever reason) outside. Please take a look at the pictures on the official website to get at least a rough idea about how awesome this place is. What you can’t see though are close-up pictures of the marble carvings – it is just amazing. It was constructed by an army of artists who carved probably millions of elephants into the marble stones. The subtlety of the decorated walls both inside but in particular in the inside of the temple are just marvelous and beyond imagination. Usually I would say “a picture says more than 1000 words”, however, there is no picture from the inside of Akshardham. Therefore, all I can do is to assure you that this place is simply stunning and mind-blowing. And it’s not just the temple, the whole garden and attached facilities around it are as awesome as the temple itself. There’s a photo stand which allowed us to take at least on picture with us – it’s bad quality (as you can see), because we’re standing in the shade, highlighted by the flashlight, while the temple is located in the scorching 43°C, and the cheap print-out was than scanned back at IBM – but it’s a piece of memory. But let’s get back to the places one has to visit, just like Taj Mahal – and one of the most prominent places in Delhi (at least from my perspective, because it’s one of the few places I new of before I came here) is India Gate. Needless to say that this was inspired by the Arce de Triomphe, and it resembles another similarity: just like the Champs-Élysées leading to the latter, there is a huge ceremonial street that leads your way to India Gate, namely Rajpath. 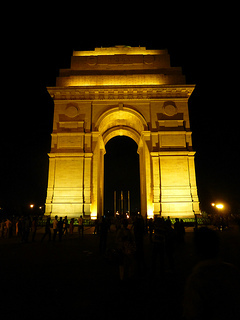 We went there at night, as you can see on the picture, and I was surprised to get to a place in Delhi for the first time which was not overcrowded and constantly covered by the noise of nearby passing and honking cars. Seriously, cars in India honk so much that after a few days you just ignore that sound – and you only realize that once this sound is gone, like on that evening. Except for just a few other visitors and some street dogs, we were almost the only ones walking up the 1.5 miles up to India Gate. Here’s the proof! Someone asked me if I haven’t had anything else to eat other than what I posted in my first blog article. Well, I’ve had a couple of things. In fact, I’m enjoying the food so much over here that my initial idea (eat healthy vegetarian Indian food and lose some weight) is turning into the opposite (I’m seriously concerned about not being able to do extensive mountain hiking back in Switzerland). The only reason why I haven’t shared any pictures of these culinary delights is because I don’t know what to pick. 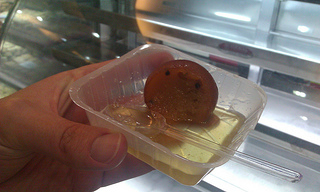 For example, we’re having gulab jamun almost every other day, either at IBM or Evergreen, but it’s so delicious that I always forgot to take a picture. Here’s at least half a piece of it, picture taken at the amazing sweet store called Evergreen. Evergreen and Ananda Bhavan are some of the better, more hygienic restaurants. 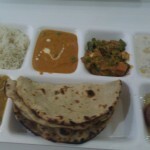 However, many people say if you want to have real Indian or, in our case, real Delhi food, you need to go to a dhaba. Dhaba means something like “restaurant at a highway”, but the definition is somewhat vague; in fact, one of the very nice dhabas we found was located in a small side street, and though it’s surroundings didn’t look very tidy and inviting, the dhaba itself was surprisingly clean. Our favorite and most frequently visited dhaba, which is called Punjab, has arguably the best lachcha parantha I’ve found so far. 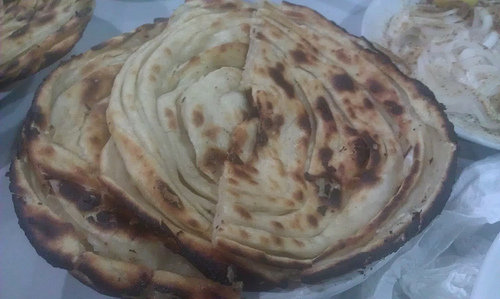 “Lachcha” translates to something like layers, and this bread is created by taking a very thin parantha, putting some oil and then another layer of parantha, and so forth. I’ve tried lachcha parantha in many different places in Delhi (and in Manali), but the one at Punjab is still by far the best. My favorite dinner is this in combination with shahi paneer, kadai paneer, or malai kofta (unfortunately Punjab does not have paneer burjhi). 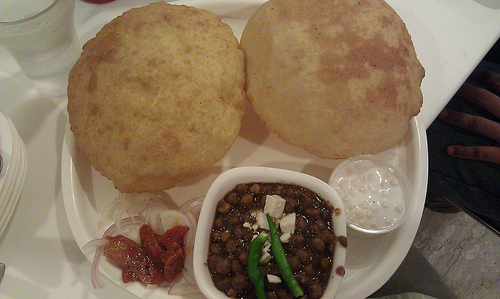 I’ll end this blog post with a dish that is – according to my sources – typical Delhi food: Chana bhatura. The bread is hollow and should be flattened such that one can break it into pieces and eat the brown chickpea stuff at the bottom. As usual, the Indian spices made something that I usually don’t like that much (chickpeas) quite delicious. 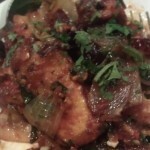 The pieces of paneer were quite a good fit to it. The small white cup on the left is raita, some kind of yogurt dish; and since this is a good counter for too hot and spicy food, I tried the green chilis that were so appealing to me. After half of it the others noted that I started sweating a bit. But I guess that’s nothing unusual for Delhi during monsoon season, is it? As a passionate hiker I always wanted to see the Himalayas. After many nights of discussing and planning we chose Manali, which is commonly known as “The Switzerland of India” – obviously I had to go there! We left on Friday afternoon and arrived in Manali at 7am after a 14 hour bus ride. Strenuous, but thanks to a comfortable acclimatized semi-sleeper bus we were able to sleep. Upon arrival it turned out that the hotel we blindly booked a week before was a lucky strike: the restaurant had very delicious food, our “cheapest choice 4 bed room” was upgraded into two honeymoon suites, and the hotel was located at the end of the mall, providing us with a nice view of the city and the mountain range. 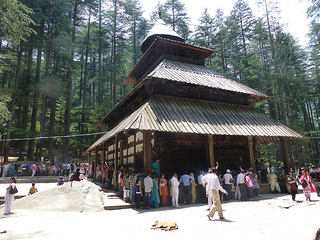 On our first day, we walked around in Manali and went to see some temples; one of them seemed to be very old and important since people stood in line for about an hour to get in. Instead of queuing for that we went around and delved into the other tourist attractions: the killer rabbit from Monthy Python’s Holy Grail, a yak, and nice street shops. We ended the evening by escaping from the busy center and enjoyed the fresh air at the river Beas. On that occasion we discovered that water from melted glaciers is indeed freezing cold. We went back to the hotel and straight to bed after dinner, since we had to get up at 3am next morning for the central and most anticipated part of our trip: Rohtang Pass. 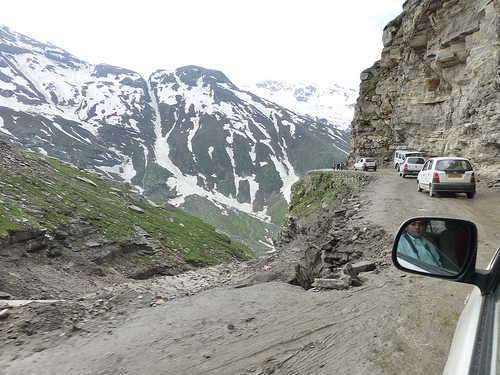 It’s the first leg of a mountain highway to the gorgeous city Leh and passes several mountain ranges of the Himalayas. 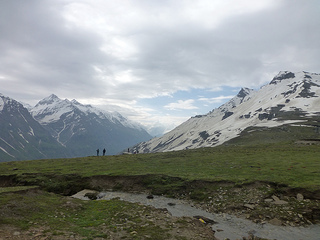 But most importantly, it’s one of the main tourist attractions for Manali visitors, as it offers an amazing overview of many 7000+ meters peaks. But due to this, it’s also extremely overcrowded and if you start after 6am there is a big chance that you will be stuck in traffic the whole day and not get to the top – despite the distance being only 50km! Even though I got used to the crazy Indian driving style by taking our daily cab to IBM, the drive to Rohtang Pass was one step up on the roller coaster experience scale. More than once the street became quite narrow, but even if cars or big trucks approached us the driver would not slow down. With maximum accuracy and confidence he stayed on the edge of the track and raced past every obstacle. A weird mix of lunatic driving and extreme calmness, but we felt as if we couldn’t have got any better driver. Something that I realized only later when we were on our bus to Delhi: neither the cabs in Manali nor the big buses have any scratches. It’s like a miracle – or just pure skill. Maybe Michael Schumacher has Indian ancestors? After about 3 hours of driving uphill we reached what was the summit of our trip. We had only about one hour to enjoy the view and therefore tried to make the most of it. Since I’ve never been on 4000 meters before, I wanted to see how well I adjust to height, and started running around in search for nice photo shots. Turned out I didn’t have any problems, seems like hiking in the Alps pays off eventually. However, the picture on the right illustrates how thin the air is: the square package of coconut wafers that contains only very little air blew up to a big ball due to the sea-level air pressure inside. Although the trip was pretty packed for a weekend we all felt that it was totally worth all the effort. 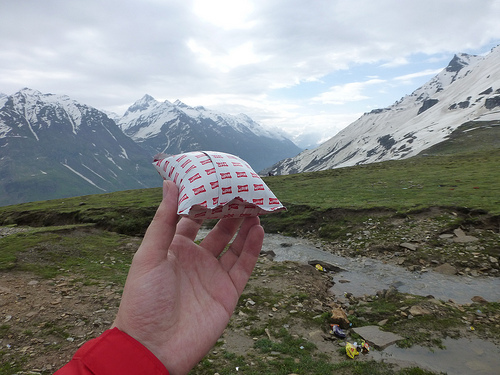 After leaving Rohtang Pass we took several stops to take more pictures, enjoying every single minute. The view is simply stunning and although the picture on the right might bear similarities to some Swiss mountain ranges (look at this picture I took in Grindelwald last October), keep in mind that we were on 4000 meter (which is higher than the highest hiking spot in the Alps) and all peaks around us were 2000-3000 meters higher. I still haven’t figured out the names of the peaks on the pictures, but Himachal Pradesh has many 7000+ mountains. Don’t fool yourself by the elevated treeline and the lack of snow on 4000+ meters – after all, this was in the peak of summer and quite closer to the equator than Europe. More pictures from this trip on my Flickr account (thanks to Amiya and Rachel for sharing pictures). 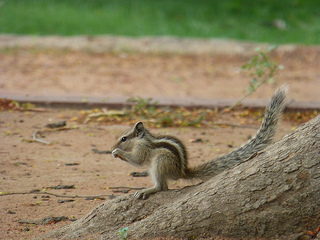 I’ve also added some random pictures from Delhi, take a look at the other sets if you’re interested. I had certain expectations of Indian food, but zero experience before I went to Delhi (I wouldn’t count the Delhi Curry as real Indian food). Combined with some of the more negative comments (“everything will be so spicy”, “your stomach can’t digest it”) and my attitude for less vegetarian but more carnivore-oriented food back in Zurich, my expectations weren’t that high. And here I am, blown away by a multitude of different meals, almost every single one of them having more variety in taste and flavors than what you get during an entire week of Zurich’s Mensa (cafeteria) dishes. People have been asking me a lot what my favorite dish was so far, but that’s kind of like asking a father of ten who his favorite child is. Instead, I’ll try to share some highlights so far, whenever possible with pictures taken with my phone. My first dinner after arrival was at a place called Fruto Freesh, where I had North Indian Thali, a meal comprising a selection of several North Indian dishes. In addition to rice and paratha (bread) it came along with yellow dal, some spiced vegetables (both quite cilantro heavy, but good), yogurt (it might also have been curd, I can’t remember), and some dessert on the lower left. But by far the best was mattar paneer. Amazing start! 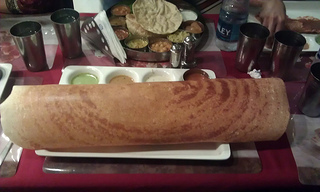 The following day we went to a South Indian restaurant – where I had South Indian Thali. I don’t recall all the different things, but I guess it came with two dals, yogurt, vegetables, a soup and a spicy dip. 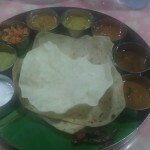 But even more impressive than the food itself was the all-around Indian experience – served on a banana leaf, and all finger food. I’m still working on my skills to eat as much of the dips and dals with the bread just using my right hand (you don’t use your left hand for food). Let’s say it’s easier than eating with Chinese chopsticks, something I’ll probably never learn. Since then, the usual day looks like this: North Indian lunch at IBM (very delicious all-you-can-eat) and South Indian dinner at Ananda Bhavan. It’ll probably take a month before I tried all the different dishes. But so far, there was nothing that I absolutely didn’t like; something I can’t even remotely say about European food. It’s also not as spicy as I’ve expected it to be, everything has been fine so far, and even if something is too spicy, there’s always curd, yogurt, or butter milk. At the same time, I have to admit that I haven’t been to the really spicy restaurants yet. 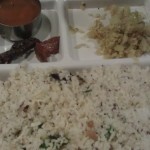 I’ll conclude with three dishes from Ananda Bhavan that I would probably name my favorites so far. 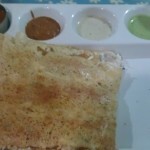 One of them is coconut rava masala dosa (right). It’s essentially a baked, rolled or folded, and filled pancake. As all breads, pancakes, and alike, it’s made without eggs; eggs count as non-vegetarian food for Hindus. As you can see on the picture, it comes with three chutneys: some lightly spiced tomato chutney (2nd left), cilantro chutney (right), and coconut chutney (2nd right). The amazing idea about this dish: put coconut flakes on top of a pancake. Why haven’t I thought about this before? Everyone who knows me is aware of the fact that any dish plus coconuts results in pure awesomeness! Obviously I had to try everything else with coconuts after that. And without a doubt I can say that the coconut rice on the left was by far the best rice I have ever had. EVER. Seriously, so delicious. And it wasn’t just me, all the others agreed that it was really good, so this is a really unbiased objective review. Speaking of coconut, did I mention that there’s a fruit vendor right in front of our guest house who offers fresh coconut drinks? He cuts it open for you with a big machete and you can enjoy the pure unspoiled taste of sweet and refreshing coconut – arguably the cleanest drink you can have in Delhi. Last but not least there is paneer 65. I have no idea where the name comes from, neither did any of my fellow interns. Rumors say it’s made using 65 different spices. After having tasted it, I have no doubt this could be true; tastes like an explosion of different flavors in your mouth. It’s an Indian-Chinese fusion: paneer is some kind of cheese which has a consistency similar to tofu, but tastes more like sweet buffalo mozzarella. Along with the variety of 65 different spices it’s a delicious experience you just can’t describe. Like everything else.